Cold air sinks and this builds HIGH pressure over the Polar regions as part of the “normal” global atmospheric circulation. Hot air rises over the Equator creating LOW pressure. Tropical and Polar air flows in a series of complex but fairly predictable patterns in between. These cells power global weather. Polar air meets Tropical air in the mid-latitudes at the Polar Front. Fronts, low pressure systems and jet streams are all a product of this unhappy meeting of two the different air masses. The jet stream (fast flowing ribbons of westerly winds at altitudes of 15 km) usually acts like a belt and keeps the Polar air inside the high latitudes. The mid-latitude jet usually sits somewhere near the UK during “normal” winters and brings in relatively mild westerly winds circulating around depressions with rain and wind. 2013 has seen higher than usual pressure over the Polar regions and these have pushed the jet stream and attendant LOW pressure systems further south than usual, somewhere over the Mediterranean which has seen more rain and wind than usual. Winds blow from HIGH to low pressure and, without the belt-like effect of jetstreams to keep them in, frigid polar air has flooded out across the mid-latitudes. Anywhere located north of the jetstream has been left exposed to these incursions of the Arctic air mass. 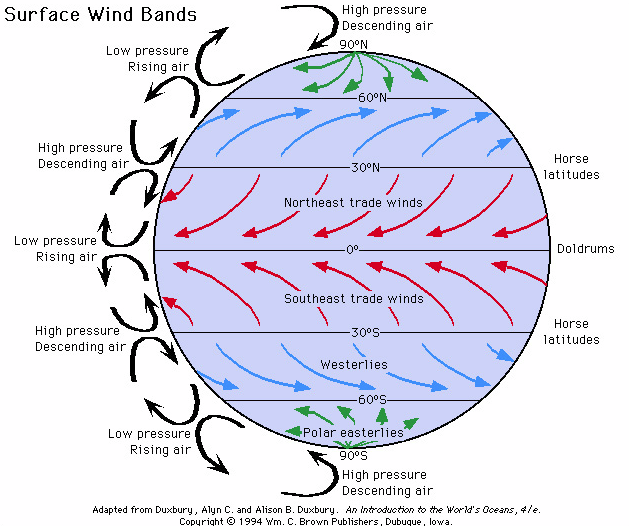 Winds from the Pole tend to blow from the NE or East rather than straight from the North to South because the spin of the Earth deflects them to the right … the coriolis force. Hence, “the Beast from the East” in the UK. 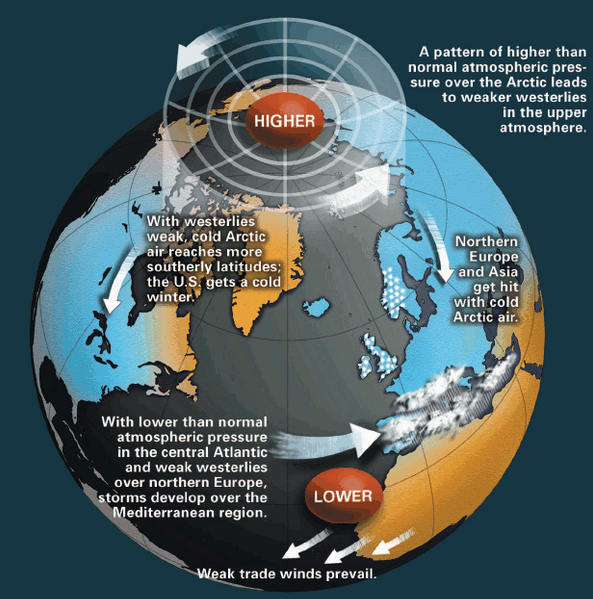 The index measuring the balance between HIGH pressure in the north and LOW to the south is called the Arctic Oscillation and this has been at record breaking negative figures this Spring: meaning the pressure over the Pole is unusually high compared to the low pressure over the mid-latitudes. Blocking HIGH pressure prevented warm air getting to the UK on several occasions this Spring and, with this fresh in our minds, we must consider BLOCKING HIGHS as “caught red handed” in the act of causing our cold spring. However, it seems that there is always a bigger fish and we must find the master criminal controlling the BLOCKS to get nearer the real killer of Spring2013! We must find the cause behind these increased heights over the Pole? The answer might be the loss of Arctic sea ice.